In my last post, I was telling you of my belated New Year's resolution to complete all my UFOs (unfinished Objects). However, I only got about half way through the list last time before I decided the post was getting epically long. So here is Part 2: the rest of them. Jean Greenhowe Teddy. Another almost finished project. This was born from a skein of beautiful hand dyed merino I bought at a craft show. I love the wool and he is just the right level of fuzziness and squishy-ness. But I can't get his face right. He is supposed to have knitted nose and no mouth (see pattern picture below). I have done this but then removed it cos it just wasn't right... Also his back seam is off centre (which makes me cranky). Tropical Bird. My Mum gave my kids a Women's Weekly Book called "Knit a Square: Make a Toy". This is a combined effort from a few people knitting the squares. It's all done - just needs sewing up now. (Is anyone getting the impression this is my least favourite part of knitting toys?) This one is for sale or gifting. This is what It should look like when I assemble it. Prudence Mapstone Scrumble Handbag. It's been a bit of a tradition for the last 15 years or so that I go to a Craft Show for my birthday with my Mum and littlest sister and then they buy me something crafty I love as my birthday present. We used to have the Stitches and Craft Show on around mid March at the Caulfield Racecourse in Melbourne. However, it disappeared from this venue a few years ago so this is a tradition I really missed this year. This bag is an unfinished birthday present project from about 4 or 5 years ago. My Mum bought me the book, my sister the plastic bag frame. I have this vision of a handbag covered in a multicoloured carpet of flowers and leaves - sort of like a tropical forest. Here's the bag frame. At the moment it is covered with some fake fur pieces I knitted as the cuffs and collar of a cardigan that didn't really work out. I did re-knit the rest of the cardigan but without the fake fur collar. However, I don't like this and I'm got to take it off. Here are some of the leaves I am going to use. I really like the garter stitch embroidered ones. At the last craft show it went to late last year, I got the opportunity to have a sit down class with Prudence Mapstone and get to refine my skills at freeform knitting and crochet. Here's the little scrumble I did with my kit in class. I'm definitely re-inspired to finish this bag now. I'm not sure about the colour palette I'm using though. I have this favourite dull golden khaki cardigan I bought a few years ago - a commercial one not a hand-knit. However, It is the most comfortable thing to wear and I love the swing and shape of it. Its one problem is that it has three quarter length sleeves limiting the times of year I can wear it. Then I found this cute 5ply baby yarn on sale in Summer at Spotlight. I bought what I thought was enough yarn to knit a long sleeved cardigan but didn't factor in the fact that it has a swirly lower edge strip and a wide collar. Here's how far I have got, upper fronts, upper back and two sleeves done. But I only have 2 and a bit balls left of the yarn. And that's not going to be enough. So here's Plan B, I have some really disgusting brown coloured 5ply which appears to be nearly as old as I am in my stash so I'll knit the lower part in stripes. The brown tones nicely with the darkest part of the variegated yarn I was using. Then I should have enough to do the front edgings and collar in the original yarn. AK Traditions Doll. This was a 40th birthday gift from my mum, my sister and my Aunty Carol. This is a kit for a doll from AK Traditions. 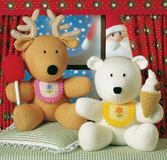 I have been admiring AK traditions knitted doll kits for a long time. I love their modern twist on ethnic traditions and the quality of the materials they put in their kits. This is a dress-up-doll for grown-ups. As well as the doll, I have a number of different patterns to make her clothes, both knitted and sewn. Here are the doll bits I have knitted so far, both legs, the body back and front with integrated underwear, the head front and back and one arm. Its almost ready to be sewn up and stuffed. This is a case of slow deliberate procrastination. Its the knitting equivalent of reading a good book really slowly to draw out the goodness of it. It is so beautiful to knit with soft springy merino wool, I don't really want to finish the knitting. This is really a once in a lifetime knit. Here's what the finished doll will look like (unclothed). And here's the dressed version. My chosen colourway is the one on the left. And I'm being a good girl and sewing in the ends as I go. 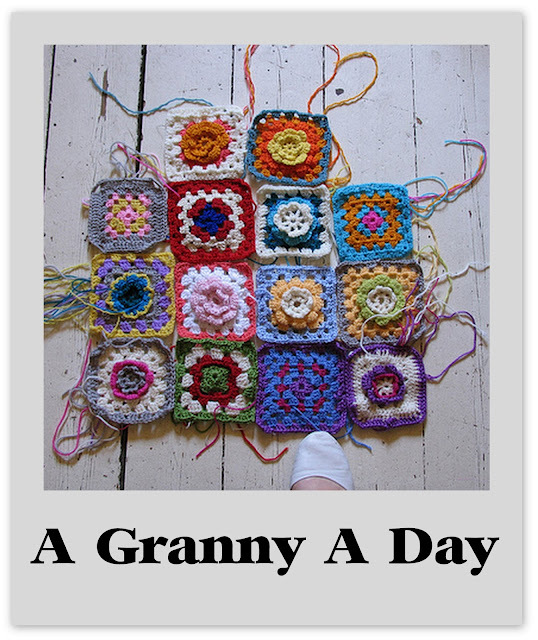 To keep me on track, I signed up for Pip Lincolne of Meet Me at Mikes' Granny a Day Challenge. So this project is now linked on her page so I can get cheered on to victory (i.e. granny rug completion) by the rest of the challenge participants. Hey, a little bit of encouragement goes a long way. There are actually more of these now.